Panthers Group is committed to best practice in all areas of Corporate Governance. 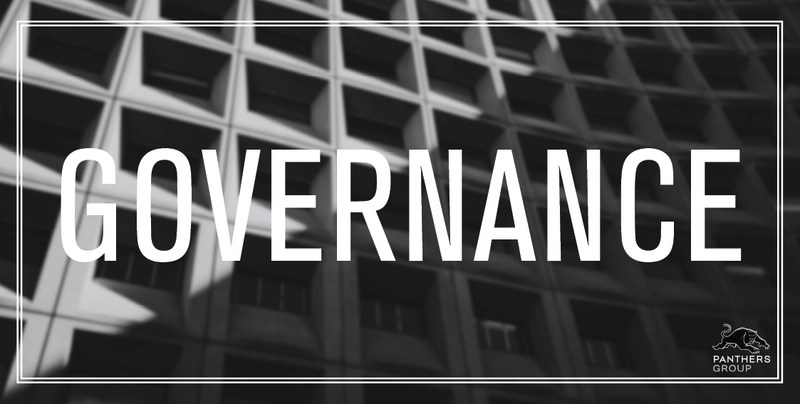 We believe that Corporate Governance facilitates effective management and control of the business, which in turn enables Panthers to deliver the best results to all its stakeholders. The Board of Directors is accountable to the members for the overview of the financial management, viability and performance of the Panthers Group. The Board’s principal objective is to increase member value while ensuring that overall activities are properly managed. All Directors have unrestricted access to company records and information and receive detailed financial and operational reports from executive management during the year, to enable them to carry out their duties. The Board meets formally at least 12 times each year, and also from time to time, to deal with specific matters that require attention between scheduled meetings. Panthers Group is committed to the highest standards of ethical business conduct. As part of this commitment, Panthers Group has an internal Code of Conduct to guide Board members, executives, management and employees in carrying out their duties and responsibilities. The Board utilises a number of Sub-committees to support it in matters which require more intensive review. This Sub-committee consists of the Chairman, and Deputy Chairman. They meet monthly with the CEO to maintain a regular communication arrangement between the Board and CEO. The purpose of the meeting is to discuss issues such as Panthers Group key result areas, strategic and business planning and other important issues. The Finance and Audit Sub-committee’s role is to oversee the financial affairs of the Penrith Rugby League Club Limited. This sub-committee’s purpose is to review and make recommendations to the Penrith Rigby League Club Board about the financial affairs and policies of Panthers Group. as well as industry standards. This Sub-committee is responsible for hearing disciplinary matters in relation to members. The ClubGRANTS Sub-committee administers compliance with the Community Development and Expenditure Tax rebate scheme known as “ClubGRANTS”, and makes recommendations to the Board for approval of grants under Category 1 and 2 of that scheme for payment to Community recipients.